Distance from Webster: Lake plus out-and-back Nature Study: 4.6 miles. Distance around Lake: 1.6 miles; 3 = 4.8 miles. Distance from Chester Heights to Webster: 0.5 miles. Surface: Mostly smooth but a fair amount of rockiness, on brief stretches of Nature Study. After lots of improvements, in part financed by Paine-to-Pain money, the trail no longer gets muddy. Of Note: Just before going from Nature Study to Twin Lakes, you go under the Hutch. It is dark (although work is being done on getting a light) and it sometimes has a muddy spot in the center. Your best bet is to keep to the wall side. The County has smoothed this section. Hilliness: A few brief hills, which are not long. SEPTEMBER 2017: TWIN LAKES: The trail on the west side and around at the south end (over the dam) and up a bit have been widened, which should prevent the encroachment of vegetation. Also, at the northern end, the short connector has also been widened and re-surfaced. Horses: These trails, particularly around the Lake, are bridle paths, and particularly on nice weekends you’ll run into horses, to which you give the right-of-way. The horses generally meander along, but I’ve seen the horse and rider pictured in this article going at a good clip, so you must stay alert, especially on the blind turns on the Hutch side of the Lake. Other: Entering at the Nature Study Woods entrance on Webster Avenue cuts maybe a mile total. I have marked this trail from Chester Heights around the lake; the mileage is to the lake and once around, not including the return leg. This is the loop of the lake itself. These are the trails with which I am most familiar, having run on them when I ran for Iona Prep in the early 1970s. I rediscovered them some years ago, and have worked to expand my knowledge. The trail is frequented by Iona College rrunners, among the top cross-country schools in the country. The photo on the left is in Nature Study near its end at Webster Avenue. I would say about half the trail is like this and the other half is narrower. I’ve begun to do some marathon training, which means long runs. The natural place for long trail runs is the Rockefeller. But I did a nice 18.5 miler at Twin Lakes/Nature Study. Each loop is about 4.62 miles. I park in the stable parking lot (you can also park on Webster Avenue). The course sets up so that you can stop at your car for water and gel after each loop. Beware, however, that as the run extends, you might find your feet not lifting as much as they did earlier (this happened to me), so the footing in Nature Study becomes trickier than it normally is. Sure, it’s boring, but also convenient. You also don’t find yourself too far away if you blow up. I have never had any problems with horses on these trails, although I’ve run into them with some frequency. But because of the horse-issue, I would avoid these trails at peak riding times, like summer Sunday mornings. The first rule: HORSES HAVE THE RIGHT OF WAY. Make sure not to startle the horse, or rider. Let the rider know you’re coming and wait until you know how the rider, and horse, want you to proceed. If I pass a horse going in my direction, I gradually pick up the pace after I pass. Major parts of this network were used by the New York, Westchester & Boston Railway from 1912-1937 and there are remants of the venture here and there. The County has beenundertaking projects with respect to the trees and plants in Nature Study. There are numerous ways to enter these trails, but I will mention 3. Southwest corner of the trail is the trail head: Enter to the left of Robins Crescent. It is a little tricky to find. New Rochelle Road leaves Chester Heights en route to Pelham. It goes under the Hutchinson River Parkway as it crosses into New Rochelle. You must be on foot at this point because you go under the bridge and keep to the left, into an apartment building’s parking-lot, parallelling the Hutch. As the lot/driveway turns right around the building, keep going straight across the grass – a slight hump – and, violà, you’re on the trail. Just follow it. This is the part where Ben Bright et al. has done a great job of taking care of what had been a dangerous problem for decades. The south east end of the trail is on Webster Avenue near New Rochelle High School. That’s the “P” on the map. The entrance is well marked. The broader trail goes to your right right after you enter. If you go straight, you run down that very small hill described in the prior description. (The “Change of Seasons” photos on the homepage are taken here, showing what it looks like if you go straight.) Just go right and follow the trail until you get to a bridge. There is only one place you might get lost: You come to an intersection maybe 1/2 a mile in. Going straight is a dead-end, so you want to go left. (This is confusing on the mapbecause that makes it appear that you go straight and then right at the “T” but going straight requires you to climb down a rock. )You go under the Hutch (photo left) just before hitting the lake. It is dark and often wet, so care is required; I try to keep to the wall-side. After that, there is a switchback bridge (photo left) to get you up to the Lake. In late 2012, a new bridge was opened across the dam (over which you cross if you turn right). You can go either way, and the full loop (Google.Map) is about 1.5 miles. I describe going counter-clockwise because there are fewer ways to get lost that way. (There is only one trail to the east side of the Lake but a number of smaller, parallel ones on the west.) It’s just follow the trail at this point. It has some slight ups and downs and mud-stretches. When you cross a wooden-bridge, you can either go right or straight. If you go straight up the hill, do the following for a loop. At the intersection, take the trail ahead but slightly to the left then keep to the right on a side trail and then take the first right, which brings you onto the trail as it parallels California Road. Once there, just continue on across the driveway to the stables and around the lake, which brings you to where you crossed the bridge at the loop’s start. You can, of course, do multiple loops. You can make the loop a bit longer by going to the right after you cross the wooden bridge. But if you go right, it also takes you to the northern stretch of this trail, which allows you to pick up the bridle path to the north, ultimately to White Plains. The third entrance is on California Road. It’s the “P” on the Map. This is a small parking lot for the stables and for trail-users. In the foregoing description, the entrance is the “driveway to the stables” and you simply pick up the trail there.You can do loops of the lake, which is about 1.5 miles. This is a good place to start running up towards Saxon Woods. If you are going to do that, head north from the driveway and keep to your left, which will bring you out in the open by the entrance for Exit 18 of the Hutch. There’s a cross-walk there, but be careful. You cross the entrance and exit roads, and then you go under Mill Road and across a bridge and you’re in business. 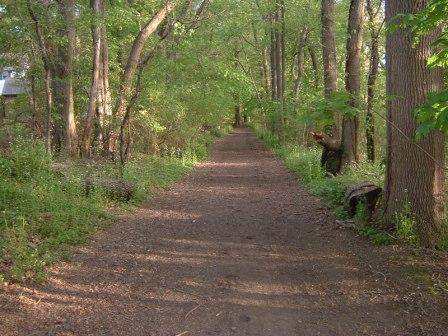 Both of the above trails hook up to the Saxon Woods Trail via a trail on the west side of the Hutch. This is not an independent trail in that there’s no convenient place to start it. You don’t need a map, but here’s one. Note the big elevation drop to Pinebrook. The trail has some treacherous footing stretches, although not like those at Saxon Woods East, so care is required. You have 3 major street-crossings (after Mamaroneck Road), Weaver Street (there’s a traffic light), Pinebrook Blvd. (where the trail drops dramatically on both sides), and Wilmot Road (where you must cross and go to your left to pick up the trail). Is this trail safe? I often run it alone but am scared! With the caveat that I’m a man and that much of the trails are away from homes, I’ve never felt uncomfortable and I’ve almost never had a run in which I saw nobody. Nature Study is a bit quieter, but it is also frequented by dog walkers, especially towards Webster Avenue, and the Iona College teams. I often see walkers going around Twin Lakes, and note that there are stables there and often horses on the trails. Can safety be guaranteed? No. But especially on week-ends, you’re unlikely to be alone. Can you ride your bike on this trails? Bikes are not permitted on any of these trails, except for the Old Croton Aqueduct trail. That said, I do see them occasionally (but never at the Rockies). Bikes are not permitted. As to strollers, as long as one stays to the right and keeps alert for horses and runners and (illegal) bikers and is ready move to the side, I see no problem. The surface is now pretty conducive to them as its generally wide enough. I’m pretty new to running and only run in the gym thus far. I’m thinking of going to the twin lake trail this weekend but just curious, have you ever ran into animals? I saw a fox (at least i think it was a fox) recently while driving on California Rd. so now i have a fear of running into something. I wouldn’t worry about wild animals. You see deer with some frequency but they get out of the way. I’ve seen a skunk, and simply turned around. I know others have seen possums. More likely are dogs and horses. As to dogs, people tend to be aware, but make sure as you approach that they know you are coming. These are equestrian trails. If you come upon a horse from the rear, make a noise to let the rider know you’re coming and wait to be signaled past. If you approach from the front, again, just make sure you’re seen and the rider tells you to come past. Slow down as you do so. I’ve never had an issue with a horse. Or a dog for that matter. When I want to run 5 to 5.5 miles, I typically have run from Webster to the east side of the lake to Saxon Woods, then arranged for a ride home (unless I am running a bit longer, in which case I take a break at Saxon, then run back to Webster.) I’d prefer to return to the Webster starting point on my own without having to retrace the entire same trail up and back (and without having to get a ride) because even on a shorter run I find up and backs over the same trail more boring than a circular loop. Yesterday I tried a counterclockwise loop to the stable area, starting at Webster. It clocked in on my Garmin at just under 4.5 miles. I think I went the right way but I’m not certain. I took the bridge to the east side of the lake and kept going north. Instead of continuing north towards Saxon Woods, I made a sharp left (about 80 degrees) on a connecting trail covered in what looked like wood chips. This brought me to the western trail where I came down just above (but not at) the Twin Lakes stable. I then turned inward and came down the western side of the lake and retraced my earlier run back to Webster. Is this the correct way to do the counterclockwise loop? I realize it’s impoosible to do the loop without going over some of the same ground twice but I was wondering how I might add another 1-2 miles without having to go farther north so I can avoid the boredom of having to turn around and come back the exact same way I went out (not including the Webster portion to the bridge and back, which I don’t mind retracing.) What if I started and finished the loop at the Pelham—New Rochelle Rd location you describe above? How much distance would that add to the 4.5? Is this additional part of the trail wide enough to avoid brushing up against foliage? Any other suggestions on how I might add the extra 1-2 miles while minimizing the need to go over the exact same path up and back? Thanks. I don’t mind repeating or out-and-backs. After all, what’s on your left going out is on the right coming home. In fact, yesterday I did 5 of the loops you describe. That wood-chip stretch was a major renovation made just before (and paid for by proceeds from) the Paine-to-Pain just held. I lock in. I also did a 20-miler using what you did four times and adding a loop of the lake. I have noted that for long runs that works because you can park in the lot on California (or on Webster for that matter) and stop briefly for fluids each loop. Since the loop is about 1.65, my suggestion is to simply add a loop to the lollipop you did yesterday. There ways to get some extra distance on the trails at Twin Lakes that are between the western stretch you ran and the river (really a stream), but I’m not familiar with them beyond knowing that some have serious rocks to cross. Off hand, I don’t know how long the spur towards Chester Heights is. It is narrow but plenty wide enough to avoid encroaching foliage. Note that there are not places to park at the trail’s end but that it has entrances on each of the streets that dead-end to it and you can park there and jump onto the trail. Thanks so much for the quick reply. Just to clarify, are you saying that to add the additional 1.65, I turn left over the bridge instead of heading back to my start at Webster and do another, second trip up the eastern side of the lake, then run north and back around to the western side, using the wooden chip crossover? And, last question: when you do the long runs, are there any “facilities” available? That’s it. You can cut the distance slightly by heading straight up the hill after crossing the wooden bridge at the northern end of the east trail, but that’s a little tricky to navigate to connect to the west trail. As to facilities, there are none.